Home→Croatia Travel→Car Rental Croatia: Cross-Border Card Necessary? The comments on this page make it clear that confusion reigns when it comes to taking a rental car to or through Bosnia-Hercegovina and Montenegro. There are all kinds of convoluted proposed solutions to the “problem” of driving from Split to Dubrovnik which takes you through a sliver of Bosnian territory. Neum is Bosnia’s only outlet to the sea and was left there for political reasons. Believe me, Croatians don’t like it either! But I digress. The question is: do you need to pay for a special cross-border card in order to enter Bosnia ? 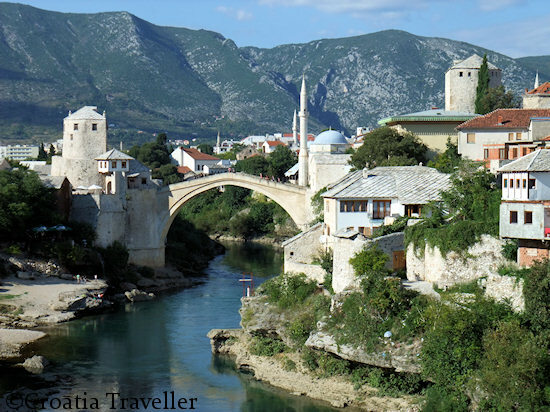 The issue is important not only for driving down the coast but for taking one of the hugely popular day trips to Mostar in Bosnia or Kotor in Montenegro. No, the law does not require a cross-border card. Let me back up a little. On my trip to Croatia in 2009, I too assumed that a cross-border card was necessary and that some car rental companies included it and some didn’t. I was completely wrong. I rented through AutoEurope on the assumption that the cross-border card was included. At the rental desk, the agent informed me that no cross-border card was ever necessary to travel to Bosnia and Montenegro because those countries were already covered on the green insurance card. Indeed, she showed me the list of included countries on the green card and–what do you know?–there were Bosnia and Montenegro. I drove to both countries and no one ever checked anything, presumably because they saw the Croatian rental plates and knew I was covered. Because of the numerous comments on my car rental page indicating that insurance companies were still insisting that a special cross-border card was necessary, I decided to call the Croatian Insurance Bureau yesterday. A spokeswoman confirmed that Bosnia and Montenegro were part of the “green card system” and that insurance issued as part of a Croatian car rental would necessarily cover those countries “unless it was crossed out”. “Why would it be crossed out?” I asked. “Well, sometimes they do that but no they are not supposed to”, she replied. Andorra, Austria, Belgium, Bosnia and Herzegovina (Neum corridor), Bulgaria, Czech Republic, Denmark, Finland, France, Germany, Great-Britain, Hungary, Ireland, Italy, Liechtenstein, Luxembourg, Monaco, Montenegro, Netherlands, Norway, Poland, Portugal, Romania, San Marino, Serbia, Slovenia, Slovakia, Spain, Sweden. A foreign use charge of 9.00 EUR per day, max. 45.00 EUR per rental applies. Vehicles passing through the Neum corridor are exempt from the foreign use charge. Now, that is fairly transparent and legal. Going to Montenegro for the day? Tell the agent, pay the EUR9 and you’re done. This is why I recommend Sixt, in addition to the fact that their prices are cheap and they have offices all over Croatia. I should note that I recently discussed the issue with the Sixt agent renting me a car (only for Croatia travel). He noted that he was aware that some agents extracted a fee for passing through the Neum corridor but that he did not do it and did not approve of the practice. cross the border at Neum in peace and consider taking a fabulous day trip to Mostar or Montenegro!